Our hook and loop (Velcro®) sanding discs are made with industrial grade stearated aluminum oxide paper. Engineered for top performance with all popular tools. Available in a full range of grits, and with three vacuum hole styles. 5", 6", 7" and 8" diameter H&L discs are listed below. 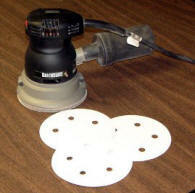 Click here for 5" W/D PSA silicon carbide discs. Sold in boxes of 50 discs or cases of 200 for greater savings. Except 7" discs are special order in boxes of 100 per grit. Download a printable 6 page catalog of our hook & loop discs.